Designed with me in mind? Definitely designed with me (and my family) in mind! 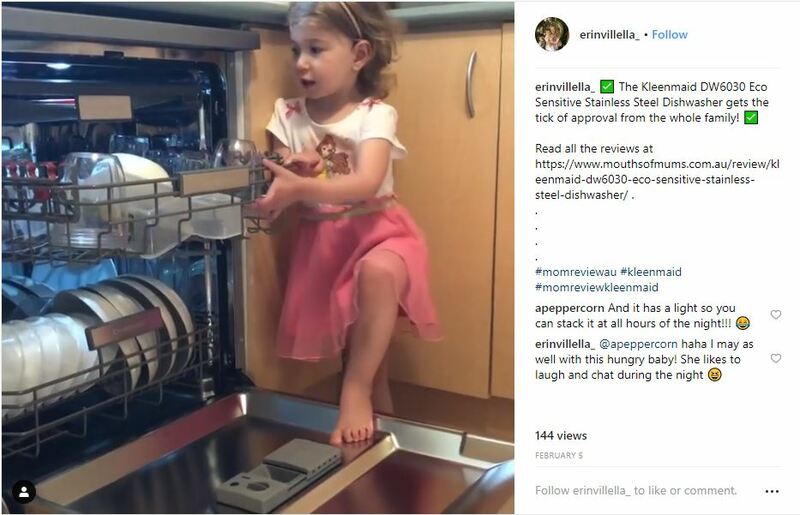 The Kleenmaid DW630 Dishwasher is so practical: not only does it have a five star water rating, it’s also easy to use, it’s really roomy (you can fit FIFTEEN place settings inside) and it’s flexible. The upper shelf for more delicate items is height adjustable meaning you can either load smaller mugs, dishes, cups and saucers on two levels, OR you can fit in taller cups or Tupperware (very handy), leaving he lower basket free for saucepans and plates. 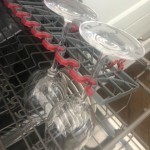 The wine glass rack is the BEST I’ve ever used, it grips the wine glass stems very firmly to keep them safe during the cycle. It’s a dream to use with a variety of programmes to choose from (and then an option button for extra functions) and of course it’s all displayed on the information technology screen on the front. Very swish – I highly recommend it! We have a house full of family staying for Christmas! Our house of four has gone to a house of 8 overnight! And with most family festivities it centres around food! 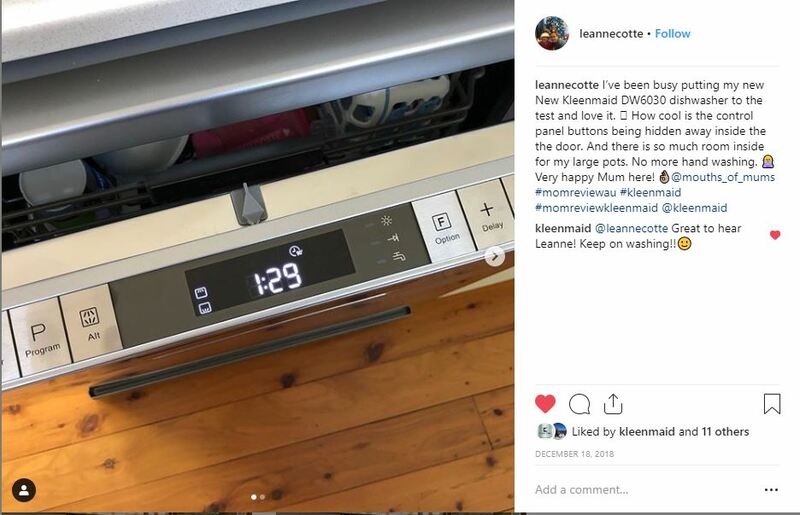 The Kleenmaid dishwasher has been put through its paces for the last three days! Stacked, cleaned and emptied 3/4 times a day! I’m so impressed that every wash EVERYTHING is clean first time! 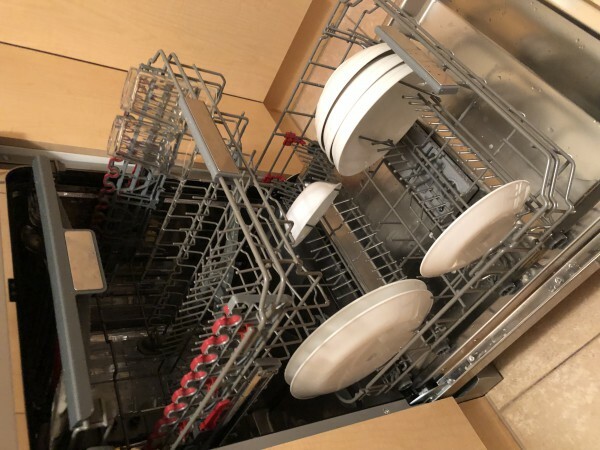 The amount I can stack in this dishwasher is unreal, everything goes in it, pots pans glasses you name it it fits and is cleaned perfectly every time. What has wired really well for this hectic time is the delay start time. Meaning I just set it and forget, with so much going on I would usually forget to turn the dishwasher on and disaster in the morning when I have no clean cutlery! 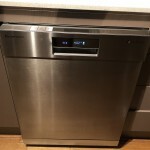 I could not be more of a fan of this dishwasher, it’s truly amazing! How does the Kleenmaid DW3060 compare? 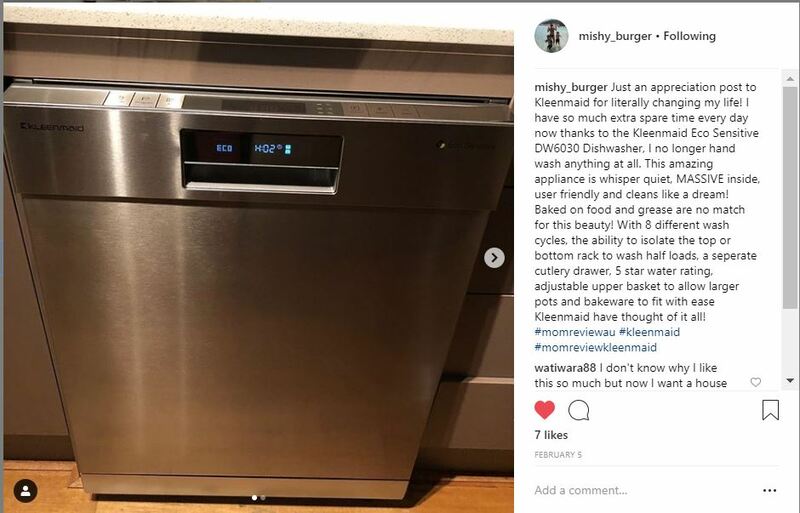 I was interested to see how the Kleenmaid DW6030 compares to my sister’s ‘other brand’ dishwasher. Does the Kleenmaid DW6030 stack up against the competition? Super easy to use, not too many programs, delayed start options, really quiet, cleans well. How does the Kleenmaid DW6030 compare to these positives? I would say the Kleenmaid DW6030 ticks all of those boxes too. 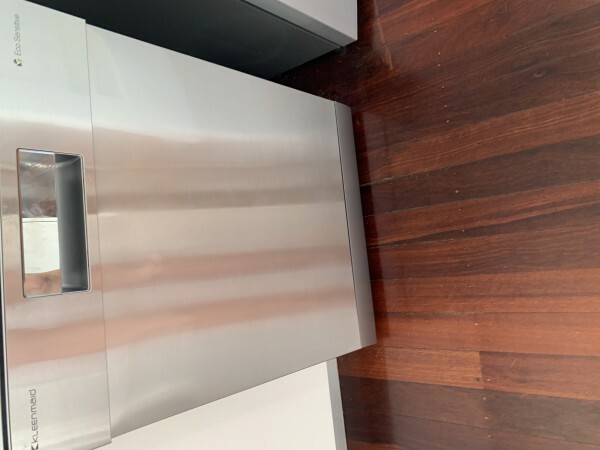 It’s very easy to use, there are a range of programs but not too many that I’m overwhelmed, you’re able to use the delayed start option at the touch of a button, it’s Whisper Quiet Brushless DC Motor ensures you barely notice the dishwasher is on, and it cleans exceptionally well. We have experimented with some of the programs, as well as the rinse aid dispenser function to ensure we are maximising the efficiency of the DW6030. Cutlery holders in the cutlery basket don’t properly fit my cutlery. Not really a spot for long knives/spatulas/egg lifter. How does the Kleenmaid DW6030 compare with the negatives? Fitting the cutlery in isn’t a worry at all with the large cutlery draw. It is extremely easy to stack, placing each different piece of cutlery in its own section to ensure they are sparkling clean the end of the wash. In regard to the spots for bigger kitchen utensils, the cutlery drawer and upper basket both allow for plenty of space. I can easily say the Kleenmaid DW6030 exceeds my expectations and definitely outperforms it’s competition! Adjustable features to meet any needs! 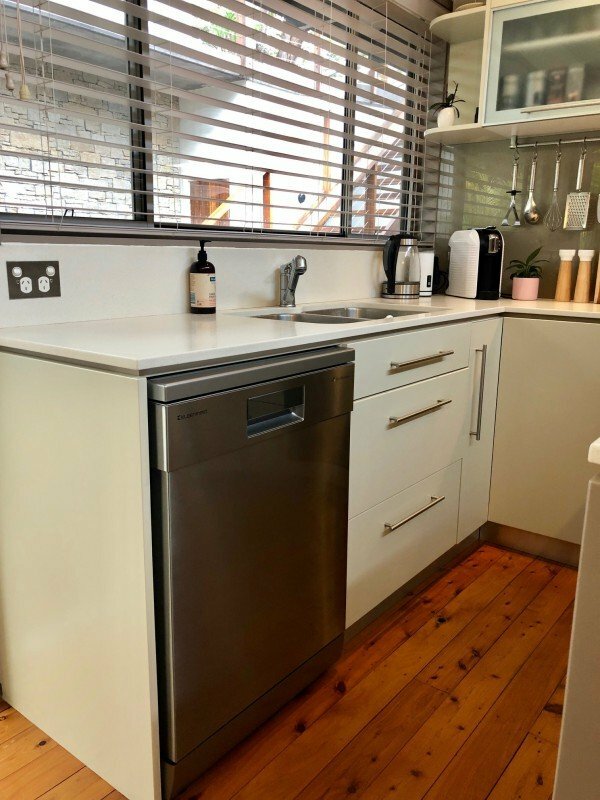 Not only does the Kleenmaid DW3060 give you a multitude of wash cycles and choice through the control panel, it also has completely adjustable internal shelving! I never would have thought that the internal shelving of a dishwasher could be adjusted to meet my family’s individual needs. The adjustments are easy to do and easy to find through the use of red contrasting materials. First of all, you can adjust the height of the upper basket. 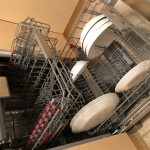 This is easy adjustment is suggested to accomodate taller dishes in either the upper or lower basket. Wow! 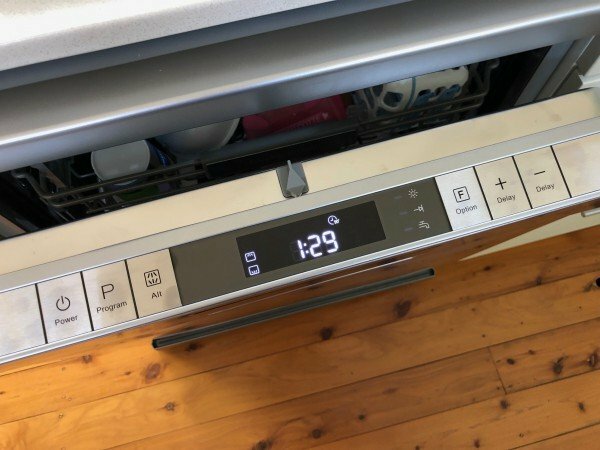 This is definitely not a feature I have ever seen on a dishwasher before. Secondly, the upper basket has folding cup shelves that are simple to click up and down. 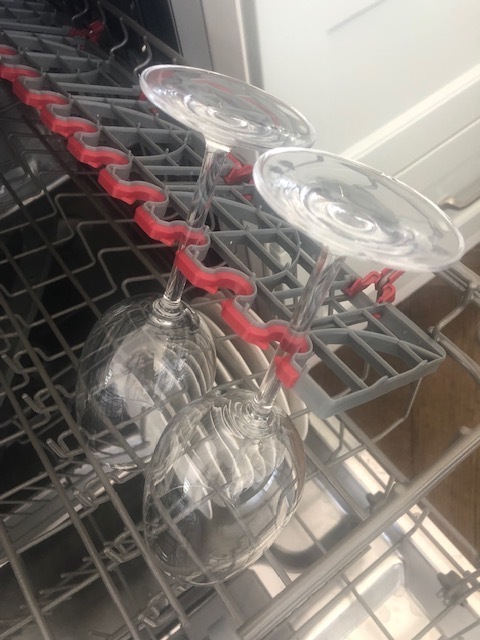 When clicked into place, the dishwasher can accomodate tall glasses, such as wine glasses that lean in the grooves on the cup shelves. This was a feature I was definitely interested in for the nights when I have a few friends over and use a number of glasses! The cup shelves can also be removed when not in use. Lastly, the plate spikes on the lower basket can be completely folded down to allow for large items such as pots. This is extremely exciting for me given that we do a huge about of cooking, like making our own pasta sauce. This means I can put ALL of those huge saucepans straight into the dishwasher! 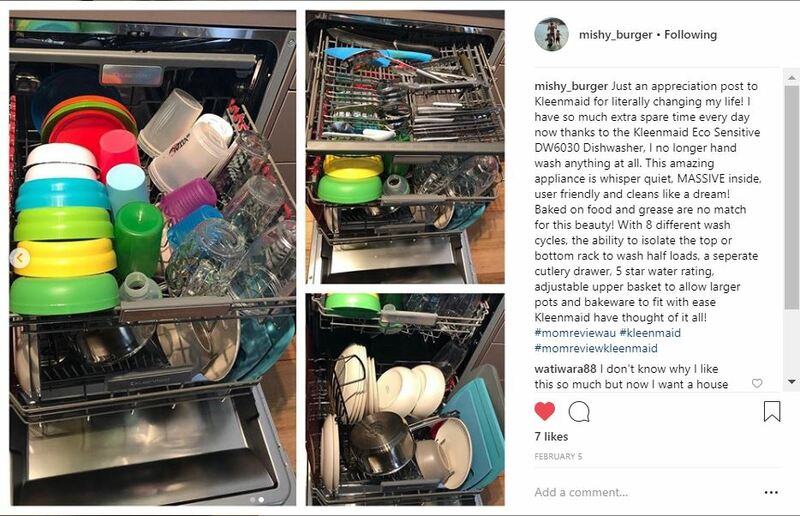 Safe to say I’m thoroughly impressed with how user friendly this dishwasher is, catering to the individual and ever changing needs of my family! I was thrilled when my new Kleenmaid DW6030 was delivered last week. 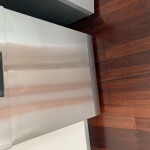 I think looks ARE important when it comes to kitchen appliances – and boy does it look sleek! It looks great in my kitchen – a massive improvement on what I had before. I was very keen to try it out straight away, and had saved the washing up from the previous night! 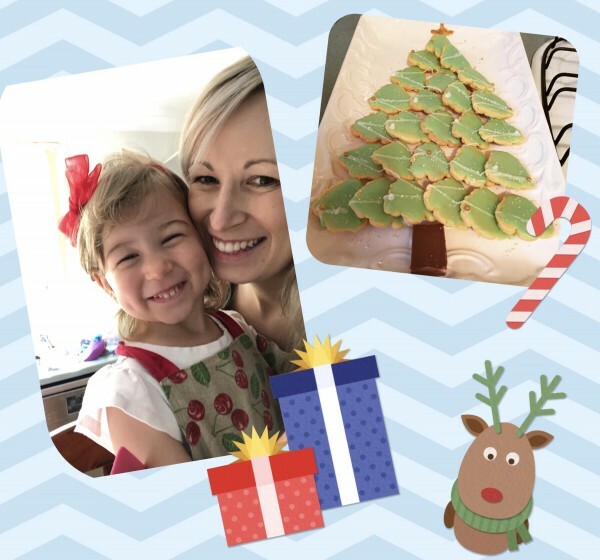 We’d had chill in the slow cooker – so the food residue was well and truly caked onto the pot and all the plates and cutlery! I powered it up first and decided to select the ECO programme to see how it would perform. It’s a longer programme at 3.15 hours – but it does use less water. Nice to have the choice. I also love the fact that the programme is displayed digitally on the front of the door, so that you can see how much time is left to run at any point. When it finished, everything was squeaky clean and bright and shiny (I swear the plates were much shinier than the ones still in my cupboard). So, first impressions are fantastic. I’m looking forward to putting it through it’s paces this Christmas as I have 24 people sitting down to dinner on Christmas Eve. 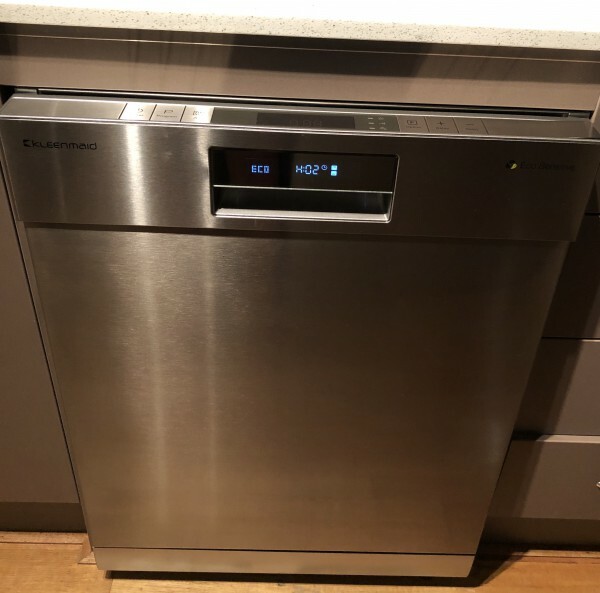 I am absolutely thrilled with the large volume of dishes I can easily fit into this amazing dishwasher. A simple push handle release adjusts the upper basket making it a breeze to fit large pots, pans and baking trays etc. The upper basket provides fold back racks to secure glassware or easily fold down to accomodate larger items such as protein cups, tupperware, lids and saucers. The seperate cutlery drawer holds 74 pieces of cutlery without impending on the upper and lower baskets. 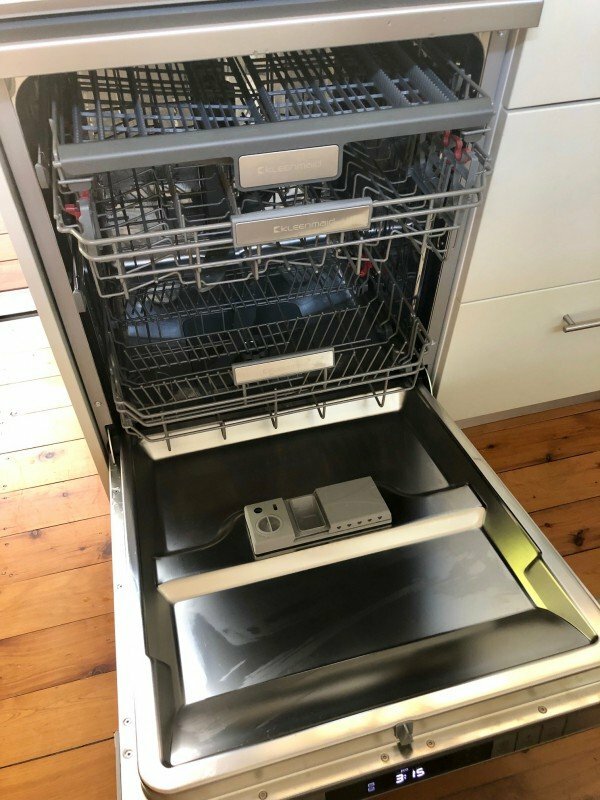 The design and functionality of the Kleenmaid Eco Sensitive DW6030 dishwasher is incredibly user friendly and simply genius in my opinion. With it being such a beautiful weekend we had friends over for a bbq, what I love about bbq’s is that I don’t have to cook and my husband does, but I’m left with the cleaning up! We had seven people over and three kids. Usually I’m left washing dishes and doing two loads in the dishwasher but not with the Kleenmaid! I was exhausted by the tone everyone had left and to be honest didn’t even rinse the dishes! I put her to work on the 1hr 30min cycle as I wanted to empty her before I went to bed ( one less job in the morning). Wine glasses clean! Plates sparkling! Enough room to only have to do one load and the kitchen bench was clear!! 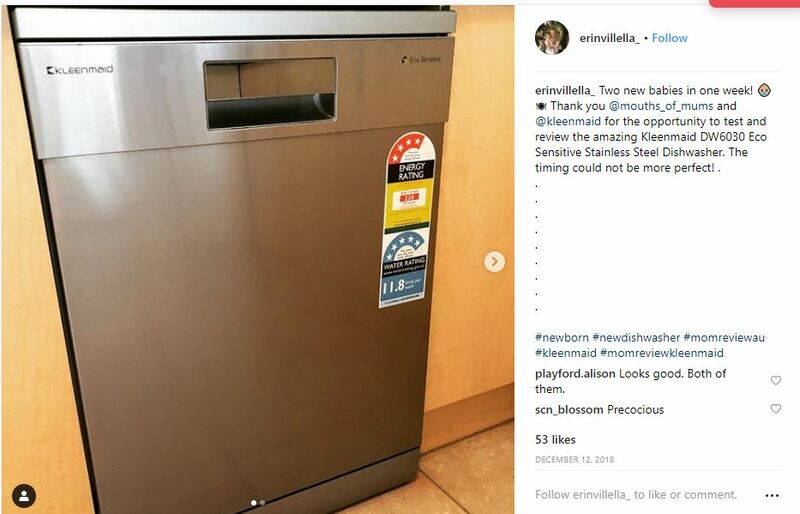 This dishwasher just gets better and better! I’m so impressed with the incredibly quiet motor! I have now used seven different program settings (which have all washed and dried exceptionally) but this review is about how impressed I am with the whisper quiet brushless DC Motor. 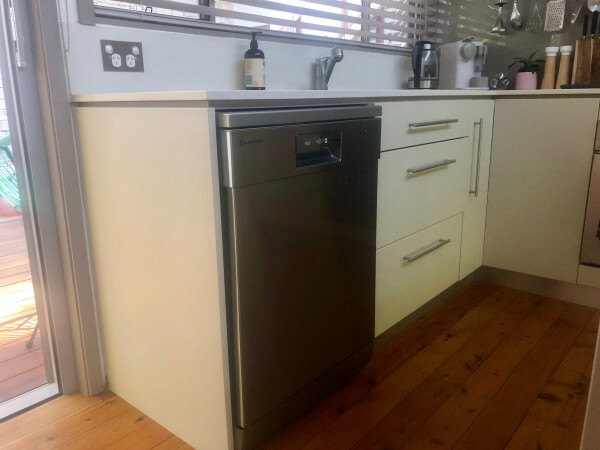 My husband was standing in the kitchen when I mentioned that the dishwasher was currently on and how amazed I was with how quiet it is..he didn’t even realise it was on, it really is whisper quiet!! 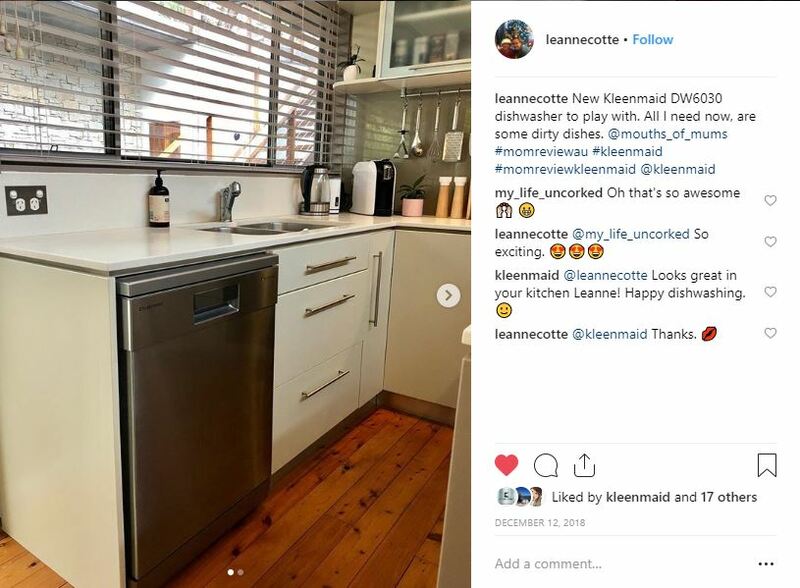 This will be so helpful for my family as my husband is a shift worker so thank you Kleenmaid for providing such an exceptional unit that rinses, washes, dries and runs like a dream! 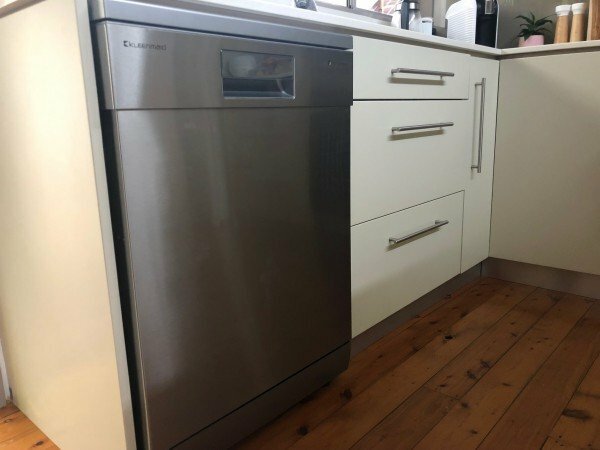 This beautiful dishwasher has just been installed. The installation process was so easy! 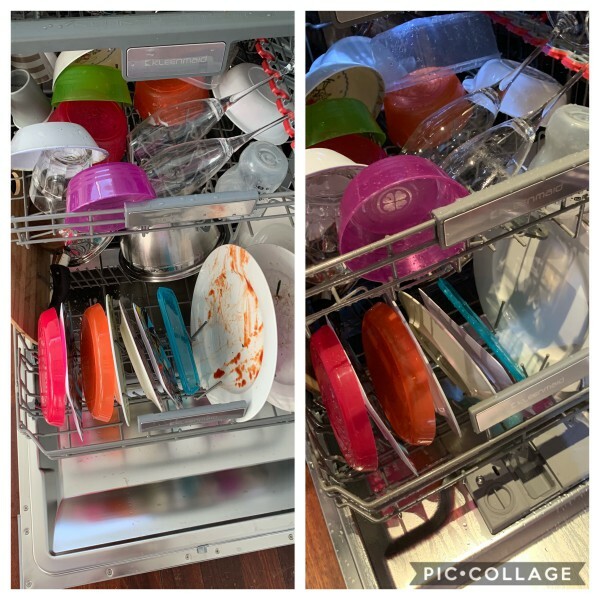 The first cycle I wanted to try was the quick 30 min, this was incredible for all the kids plastic plates and cutlery ( we would go through a full dishwasher load of them daily) the cycle started and it was even better than I thought it would be! The whisper quiet motor was great, I had to check I had actually turned the dishwasher on! It went through her cycle all plastics were amazing and clean and ready to be put away. What I really also loved is the nice beeping sound when finished to remind me that I had put her on, that’s helpful when you have a million things on the go at home. 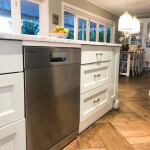 Spotless Kitchen in 30 Minutes! My toddler Siena and husband Michael can usually make enough mess in the kitchen to look like a cyclone has entered our house. After the Kleenmaid DW6030 was installed I was so excited to give it a test run. 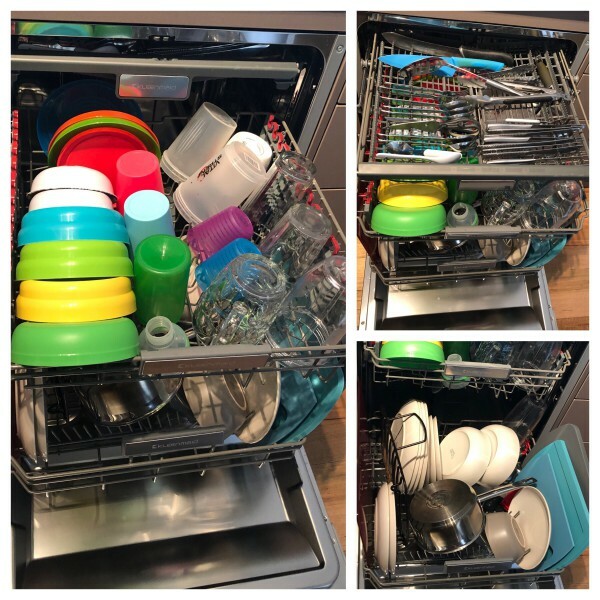 With a huge amount of space, different stacking options, a cup tray and separate cutlery tray, it was an absolute breeze to fit a days worth of dishes in (plus a few large containers). I wanted to test out the rapid wash – which only took 30 minutes! That’s faster than my washing machine! The rapid wash does a full wash (at 45 degrees celsius) and two rinses (at 55 degrees celsius) in the shorter 30 minute timeframe. It uses 0.7 Kwh of energy and 12.5L of water. With it’s shorter wash time, it does omit the drying setting which is included in every other wash, so for that reason I probably wouldn’t use this particular wash cycle on a daily basis. I would much rather let the dishwasher dry my dishes than having to do them myself! However, after giving birth to our second daughter Emilia only 9 days ago, I was extremely excited to have the kitchen spotless in a short 30 minutes! If you had told me a month ago I would be ecstatic about cleaning the kitchen and stacking a dishwasher I probably would have fallen over laughing. Tomorrow is a new day, and another chance to test out a different wash cycle!